The weather was just too fantastic today to pass up a walk. 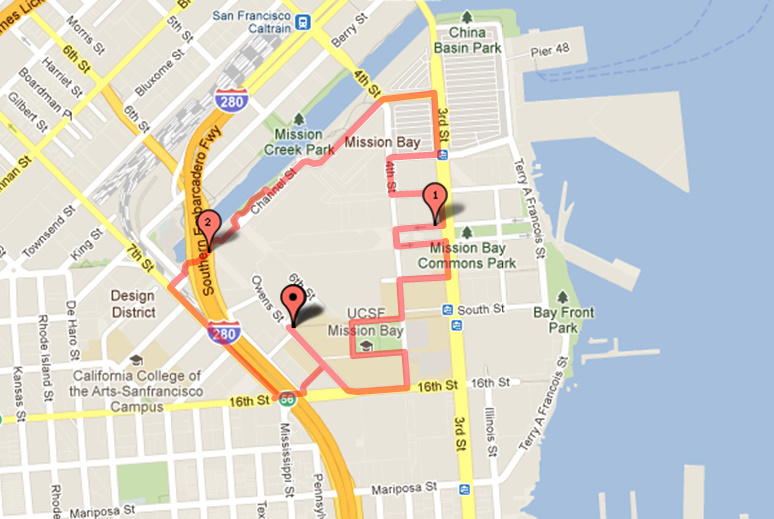 So I snuck out this afternoon and did a loop around Mission Bay. UCSF's brand spankin' new campus takes up the majority of this triangular space. ...you enter Mission Creek Park. It's really a nice, quiet spot in the middle of a bunch of construction sites and parking lots. I tested out one of the park benches by sitting and eating a snack. AND, I was pleasantly surprised by the very clean bathrooms in the park's pavillion. WIN! I've always seen these houseboats below the 280 on my commute to work. It's fun to see them at sea level. The cow is perfect. 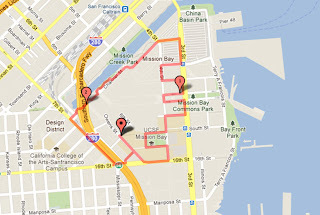 Here's where the walk got a little funky. If you decide to walk around this neighborhood, I STRONGLY suggest you stop when you get to the houseboats and then turn around, exiting the way you came, and NOT do what I did by walking this entire pedestrian maze over to 7th Street under the 280. Do NOT. I'm telling you: it's not good. Fortunately, no ill-will came to me on my trek under the 280, and by the time I crossed over the Caltrain rails, I was back to civilization and within eye-sight of my car.